We are a group of authors based in the UK and Ireland, who write books for kids aged 8-14. This website is for YOU, our lovely readers. It’s the place where we can tell you our latest news, whisper the secret stories behind our books, and share our favourite things. 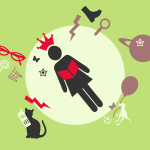 We’ll have a new blog post every day for you – plus giveaways, new book news, event announcements and more, all about girls’ books. So if you’ve ever wondered what your favourite writer’s desk looks like, which book is lighting up her bedside table right this minute, or whether when she was 13 she had a really unfortunate haircut and was afraid of swans, GIRLS ♥ BOOKS is just for you.